Today's smart security access systems mainly rely on traditional techniques that use intercoms, cameras, cards or fingerprints to authenticate users. But these systems require costly equipment, complex hardware installation and diverse maintenance needs. 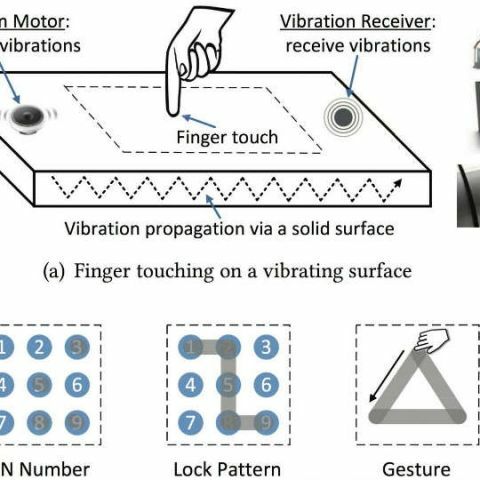 The goal of VibWrite, which integrates passcode, behavioural and physiological characteristics, is to allow user verification when fingers touch any solid surface, the researchers said. It builds on a touch-sensing technique by using vibration signals. With VibWrite, the authentication process can be performed on any solid surface beyond touch screens and on any screen size, the paper said. It includes an inexpensive vibration motor and receiver and uses minimal power. any way to secure Home network?